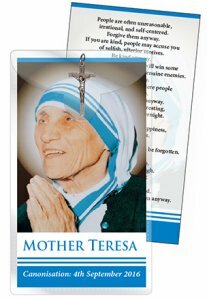 CATHOLIC GIFT SHOP LTD - Mother Teresa Memorabilia 2016 Prayer Card with Crucifix. Mother Teresa Memorabilia 2016 Prayer Card with Crucifix. Mother Teresa memorabilia Canonization 4th September 2016 prayer card with crucifix. Size: 5" x 2 3/4" with crucifix and prayer on the reverse.